I’ve wanted to visit more wineries in the Santa Cruz Mountains, and I managed to tag along with a couple of friends on a Saturday trip to the Corralitos area in December. I was the chauffeur for the day, and picked up Bryan Harrington – for whom I work part-time at Harrington Wines in San Francisco – and Wes Barton – wine blogger and expert on the Santa Cruz Mountains wine region – before continuing on our way. It was a sunny late autumn day, and fairly warm for that time of year. We drove south on Highway 17 over the mountains, then continued along Highway 1 a few miles past Santa Cruz before turning onto one of the small country roads that headed toward the wooded hills. Our destination for the day was the Corralitos Wine Trail. This touring route ties together four small family-owned wineries, all located just a few miles from one another, in the Corralitos area toward the southeast corner of the Santa Cruz Mountains AVA. This is not one of the more rugged parts of the Santa Cruz Mountains but instead encompasses more gentle forested slopes and beautiful valleys, where apple orchards and olive groves share the land with the small vineyards. As we found during our trip, many of the vineyards in the area had once been orchards. The vineyards also tend to be at lower elevations than many others in the Santa Cruz Mountains, often allowing morning fog from the ocean to spread over them during the growing season. Previously open only by appointment or during special events, the four Corralitos-area wineries have recently opened up their tasting rooms to the public from noon to 5pm on most Saturdays. Wes suggested we grab some lunch at the Corralitos Market & Sausage Co., located in “downtown” Corralitos (the market pretty much comprises the downtown). The market has been in business at this location for over 50 years. We headed for the meat and deli section at the back of the small market and were soon faced with choosing from over 20 varieties of sausage – including buffalo, venison, and ostrich – for our sandwiches. Applewood-smoked sausages are the specialty there, and we each picked a different one, served on toasted buns with plenty of help-yourself condiments. Wes picked up some jerky for the road as well. We walked back outside and sat at a picnic table just across the road from the market to enjoy our sausage sandwiches in the sun. After finishing our lunch, we drove a few miles northeast of Corralitos, past orchards and up into the densely-forested hills, until we reached our first winery stop of the day, Windy Oaks. 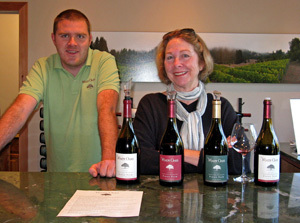 We walked into the modest tasting room and were greeted by Judy Schultze and her son James. Judy and her husband Jim own Windy Oaks, and Jim makes the wine there. It was actually James who came up with the winery name, inspired by the breezes atop the estate vineyard’s prominent ridge, where two old oak trees stand. Although they produce a little Chardonnay, Windy Oaks is known as a Pinot Noir specialist. Windy Oaks 2008 Pinot Noir, “Diane’s Block,” Estate, Santa Cruz Mountains. Light garnet color, very pretty floral and red fruit aromatics along with a touch of dried herbs and a vanilla/oak overlay. Lively texture on the palate, with good acidity and long, bright finish, very nice. Windy Oaks 2009 Pinot Noir, “Terra Narro,” Estate, Santa Cruz Mountains. Slightly darker color, with black cherry, raspberry, and a touch of cola on the nose, along with a spicier character than the “Diane’s Block.” Richer mouthfeel and more notable tannins on the lingering finish indicate that a few years of age with benefit this wine. Windy Oaks 2009 Pinot Noir, “Estate Cuvée,” Estate, Santa Cruz Mountains. Medium-light ruby color, showing black cherry and darker berry fruit along with baking spices, earth, and a bigger component of sweet oak. Bigger and bolder than the first two wines, but still nicely-balanced, this finished with a moderate tannins. Windy Oaks 2008 Pinot Noir, “Limited Release – 100% Whole Cluster,” Estate, Santa Cruz Mountains. Slightly lighter color, not as fruit-forward as the other wines, featuring more spice and herbal notes, without being overtly stemmy. There’s also bright cherry fruit and plenty of vanilla/oak. Showing more structure in the mouth than the other wines, this had moderately grippy tannins on the finish, and will need time to show its best. Jim and Judy developed their love of wine during periods when they lived in Australia and in Europe, where they became inspired by the wines of Burgundy. Wanting to produce Pinot Noir made with 100% estate-grown fruit, they bought their property in Corralitos in 1995, and began planting their vineyard the next year. More plantings followed in 1997, 1998, 2000, and 2002. In all, Windy Oaks estate vineyards comprise about 22 acres. The main vineyard, next to the winery, is broken up into a number of distinct blocks, some of which are Henry’s Block (named after Judy’s father), RC Block (where they grow their “Special Burgundy Clone” – you can guess what the RC stands for), and Judy’s Block. Aside from two acres of Syrah – planted at an adjacent site – and one acre of Chardonnay, the entire vineyard is planted to Pinot Noir. In addition, the Schultzes have another estate vineyard called Diane’s Block a few miles to the west near the town of Aptos. They have also recently begun farming another nearby property, Hartman Vineyard. Pinot clones at Windy Oaks include 115, 667, 777, Wädenswil (2A), and Pommard clones, and the various vineyard blocks contain different mixes of clones – Henry’s Block, for example, is all 2A. The vines are all trained to a VSP trellising system using bilateral cordons. In the past, fruit was sold to a number of other wineries in the area, but Windy Oaks uses almost all of the fruit these days. All of the Windy Oaks wines are made with fruit from their estate vineyards. The winery was completed in 2001, and allows the Schultzes to employ gravity flow rather than pumping to move their delicate Pinot Noir. Pinot fruit goes into open-top fermenters, and most wines are made with about 30% whole-cluster fermentation. About half of the fermentations are allowed to proceed with native yeast, while the rest are inoculated. François Freres and Remond are the favored coopers for the Pinots, which are typically barrel-aged anywhere from 17-27 months. Most of the Pinot bottlings are aged in 35-45% new oak, though a few of the higher-end bottlings see more new oak, up to 100% for the “Special Burgundy Clone.” The wines are bottled unfined and unfiltered. Windy Oaks currently produces nine different Pinot Noir bottlings – Terra Narro, Estate Cuvée, Diane’s Block, Henry’s Block, Wood Tank, Whole Cluster, Wild Yeast, Proprietor’s Reserve and Special Burgundy Clone. Currently-available wines range in price from $29 to $60, and annual production is generally just over 2,000 cases. We tasted four Pinot Noirs at the Windy Oaks tasting room. The 2008 “Diane’s Block,” from the estate vineyard about 10 miles west of the winery, was the lightest of them and featured the prettiest aromatics. The 2009 “Terra Narro” had been released only about a month before our visit, and sees less time in oak than the other bottlings – about 15 months. The 2008 “100% Whole Cluster” bottling, which spent 21 months in barrel, was distinctive for the character that the stems impart to the wine being so well-integrated for a relatively young whole-cluster bottling. All of the wines featured good acidity and balance, and were not as tannic as many other Santa Cruz Mountains Pinots often are. After our tasting, Bryan, Wes, and I wandered out into the vineyard, eventually making our way up to the ridge. At an elevation of about 1,000 feet, there is a great view out toward Watsonville and Monterey Bay beyond. The picnic tables under the oak trees on the ridgetop looked inviting – I’ll have to consider a picnic lunch there in the future. Windy Oaks has built a dedicated following for their Pinot Noirs. My experience is that they tend to show an abundance of sweet oak when young but that this characteristic integrates nicely with bottle age. The oak component of the wines was certainly in evidence in tasting the young Pinots at the winery, but looking beyond that, there was plenty to like about the wines. The captivating aromatics of the “Diane’s Block” made it my favorite of the wines we tasted, though I’d love to taste the “100% Whole Cluster” bottling after some time in the cellar. I tasted their 2008 “Wild Yeast” Pinot at this year’s Pinot Days event in San Francisco, and it was impressive too. 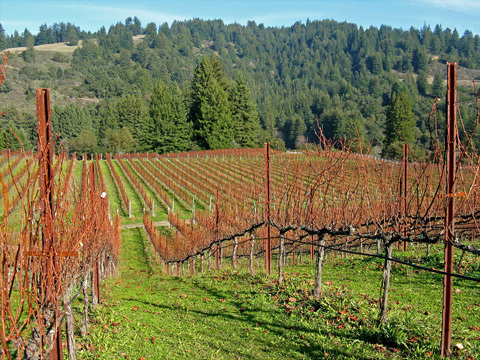 Overall, Windy Oaks produces some of the Santa Cruz Mountains’ best Pinot Noir. Leaving Windy Oaks, we backtracked past the town of Corralitos and proceeded a short distance to the west, where we came upon the winery and vineyards of Alfaro Family. The tasting room and adjacent deck overlook part of the hillside vineyards, where the leaves displayed a golden glow in the afternoon sun. The tasting room was busy, but Mary Kay Alfaro invited us to a spot along their long tasting bar. 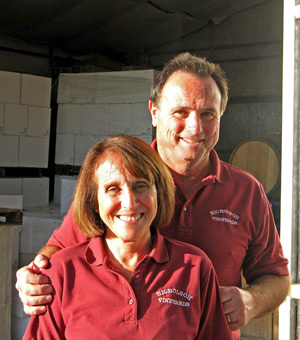 Mary Kay and her husband Richard run the winery. They had previously owned a successful artisanal bakery business before turning to wine in 1997. Richard has long been a collector of fine wines, and Mary Kay is a certified sommelier. Alfaro 2009 Chardonnay, Lindsay Paige Vineyard, Estate, Santa Cruz Mountains. Light yellow color, with minerally apple and pear aromas. Lively and medium-bodied, this had a clean and pleasant finish. Alfaro 2010 Chardonnay, “A,” Estate, Santa Cruz Mountains. Slightly lighter color, with more apparent oak and butter on the nose. A richer and more full-blown style, the finish was slightly harsh and could use some short-term cellaring to smooth it out. Alfaro 2008 Pinot Noir, “Scarlet,” Estate, Santa Cruz Mountains. Medium ruby color, the aromatics were somewhat shy, but revealed herbal black cherry and plum, earth, and sweet oak. A bit thin on the mid-palate, it finished with moderate tannins. Alfaro 2009 Pinot Noir, Garys’ Vineyard, Santa Lucia Highlands. Medium-light color, this featured ripe and forward black cherry fruit and spice – very typical SLH character. Richer mouthfeel with a long, tangy finish. Alfaro 2008 Pinot Noir, Lindsay Paige Vineyard, Estate, Santa Cruz Mountains. Medium ruby color, this showed more spice than the other Pinots, along with black cherry and darker berry fruit, tea leaf, earth, and sweet oak. More structured on the palate, this had a long, tasty finish, nice. Alfaro 2008 Merlot, “Billy K,” Estate, Santa Cruz Mountains. Medium-dark purple color, with plum, blueberry, and dried herb/tobacco aromas. Medium-full bodied with chewy tannins. Corralitos 2009 Syrah, Santa Cruz Mountains. Medium-dark color, showing plum, black olive, herbs, and pepper on the nose. Medium-bodied with a mouth-coating texture and moderate tannins, good value wine. Alfaro 2007 Syrah, Ryan Spencer Vineyard, Estate, Santa Cruz Mountains. Dark color, showing more black pepper, spice, and vanilla/oak than the Corralitos Syrah, along with more of a tart black fruit profile. Big and structured, this had grippy tannins on the finish. Richard and Mary Kay purchased an old 75-acre apple orchard and began putting in vineyards in the late ‘90s. There are currently 38 acres of vineyards planted on the property, and eight acres of recently-planted vines are now certified organic. Only a few miles from the ocean, the vineyards on the property range in elevation from about 450 to 850 feet. The Lindsay Paige Vineyard, first planted in 1998, is named for the Alfaros’ daughter, and is planted half to Chardonnay and half to Pinot Noir. The Alfaro Family Vineyard – at 16 acres, the largest of the estate vineyards – is entirely Pinot Noir. 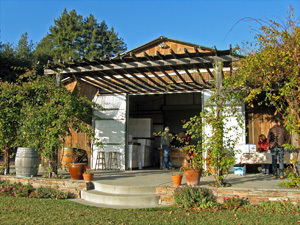 Ryan Spencer Vineyard is named after the Alfaros’ son, and includes seven acres of Chardonnay, Pinot, Syrah, and Merlot. At the highest elevation is the Mary Katherine Vineyard, with Chardonnay and Pinot Noir. Overall, over a half-dozen clones of Chardonnay are planted, along with about ten clones of Pinot Noir, and three each of Syrah and Merlot. In addition, there is a recent planting of Grüner Veltliner. Vines are planted with fairly dense spacing, as much as 2,300 vines per acre. 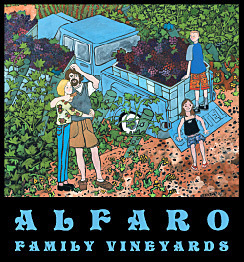 Most of the Alfaro wines are sourced from the their estate vineyards, but they purchase some fruit, including Pinot Noir from Windy Oaks’ Schultze Family Vineyard. Other purchased fruit includes Viognier, Pinot, and Zinfandel from Gimelli Vineyard in Cienega Valley in San Benito County (the Zin vines date to 1908), Chardonnay from Sleepy Hollow Vineyard and Pinot from Garys’ Vineyard – both in Santa Lucia Highlands – and Pinot from Lester Family Vineyard in nearby Aptos. The Alfaros are also now managing the 18-acre Trout Gulch Vineyard near Aptos. We tried eight wines at the Alfaro tasting room. The two Chardonnays were quite different from one another, with the Lindsay Paige bottling being more crisp and minerally and the “A” bottling, sourced from various estate vineyards, being in a bigger style. The “Scarlet” bottling changes from year to year – it’s not always a Pinot as it was with the 2008 that we tasted. The Lindsay Paige Pinot Noir was aged 20 months in 60% new oak – Mary Kay told us that they consider the Lindsay Paige bottlings to be their flagship wines. The “Billy K” Merlot is named for Mary Kay’s father, and has a photo of him on the label. The Corralitos Syrah was aged just 8 months in 10% new oak, while the bigger Ryan Spencer Syrah spent 37 months in 100% new oak. Other wines that we didn’t taste on this visit include another Chardonnay, a Viognier, several more Pinots, another Syrah, and an Old-Vine Zinfandel. Prices for current release wines range from $18 to $42, and the production is around 6,000 cases per year. The Alfaro wines are pleasant and well-made, and I thought the Corralitos Syrah was a terrific value at $18. The two Lindsay Paige Vineyard wines – the ’09 Chard and ’08 Pinot – were my favorites among the other wines we tasted. While none of these wines were really knockouts, the pretty setting and friendly, relaxed tasting room atmosphere (plus the promise of a Grüner Veltliner in the future!) all make Alfaro a worthwhile stop along the Corralitos Wine Trail. Our next stop was at Nicholson Vineyards, just a short distance from Alfaro. Winery owners Brian and Marguerite Nicholson welcomed us into their facility, a barn-like building overlooking their estate vineyard. Both Brian and Maguerite have backgrounds in the real estate business, and Brian is a ninth-generation Californian whose ancestors go back to the Spanish colonial days. Ian Brand has been their winemaker in recent years although he and the Nicholsons parted ways a short time ago. Nicholson 2008 Chardonnay, Estate, Santa Cruz Mountains. Straw color, citrus and tart pineapple aromas. Creamy texture along with good acidity, and a long, smooth finish, nice. Nicholson 2009 “Old Vine Grenache,” Santa Clara Valley. Medium-light garnet color, showing bright strawberry, cherry, and herbs on the nose. Lively on the palate, with good depth and a moderately tannic finish. Nicholson 2008 Syrah, Coastview Vineyard, Monterey County. 5% co-fermented Viognier. Medium-dark color, with peppery black fruit, spice, minerals, and a faint floral note. Medium-bodied, with a juicy acidity in the mouth and fine tannins on the finish, quite nice. Nicholson 2009 “Old Vine Zin,” TC Vineyard, Amador County. Medium-dark color, aromas of spicy ripe black cherry and raspberry, with a slightly raisiny character and an overlay of sweet vanilla/oak. Medium weight on the palate with a big, grippy finish. Nicholson 2008 Cabernet Sauvignon, Sierra Foothills. Medium-dark color, herbal currant and plum fruit and spice within a vanilla/oak framework. Medium-bodied and lively, this finished with fairly chewy tannins. The Nicholsons have four acres of vines and four acres of olive trees. The estate vineyard, situated in a narrow, sloping valley at an elevation of about 700 feet, has sandy loam soil which extends 14-15 feet deep. Originally planted in 1996, more vines were added in 2004. There are now about 1½ acres of Chardonnay and 2½ acres of Pinot Noir, with five Pinot clones mixed through the vineyard in a “selection massale” style. The olive grove was planted in 2005 with five Tuscan varieties – the Nicholsons now produce extra virgin olive oil in addition to their wine. Marguerite told us that they had just harvested their olives the week before our visit. The olive oil is produced off-site, and the Nicholsons say that it sells out quickly each year. Brian and Marguerite said that their estate grape crop was light this year (as it was in many parts of California). They round out their wine production with fruit that they purchase from a number of other vineyards. We tasted a Grenache from Besson Vineyard near Hecker Pass in Santa Clara Valley, a Syrah from Coastview Vineyard in Monterey County (co-fermented with 5% Viognier from Cedar Lane Vineyard in Arroyo Seco), a Zinfandel from 114-year old dry-farmed, head-trained vines in Amador County’s Shenandoah Valley, and a Cabernet from Penn Valley, located between Marysville and Grass Valley in the northern Sierra Foothills. The Nicholsons produce a number of wines, including Chardonnay, Viognier, Pinot Noir, Grenache, Syrah, Sangiovese, Zinfandel, and Cabernet Sauvignon. The production naturally varies somewhat with the vintage, but averages about 1,000 cases per year. There were a few current releases that we didn’t taste on our visit, including another Chardonnay and Zin, and a couple of Pinots. One of the Pinots is sourced from the Nicholson’s estate vineyard and another is from Split Rail Vineyard, at 1,700-foot elevation in the mountains near Corralitos (fruit from Split Rail has also gone to David Bruce). Prices for the current releases range from $24 to $39. Brian and Marguerite were very friendly hosts, and the small and simple tasting counter inside the winery helped create a pleasant and low-key tasting experience. The 2008 Chardonnay and 2008 Syrah were my favorites of the five wines we tasted, and I thought they were two of the better wines of the entire day. I’ve tasted a few Nicholson wines in the past, and I think that the overall quality is on the upswing – a trend that I hope will continue in the future. We’d planned to visit Pleasant Valley Vineyards, the fourth of the Corralitos Wine Trail wineries, but we learned that they were closed that day for a private event. It was still early enough that we had time for another stop before heading home, so we decided to drive back west a few miles along Highway 1 to the town of Soquel, where we continued up a hillside to Soquel Vineyards. By the time we arrived in the late afternoon, it was not long before closing time. A sign outside the winery described two different tasting flights, one poured inside the tasting room and one outside. With the sun going down over the mountains and the temperature dropping, we decided on the indoor tasting. Soquel 2008 Chardonnay, “Partners’ Reserve,” Meyley Vineyard, Ben Lomond Mountain. Light yellow color, featuring apple, spice, and toasty oak on the nose. Big and rich on the palate, with a viscous finish. Soquel 2010 Chardonnay, Meyley Vineyard, Santa Cruz Mountains. Slightly lighter color, this was brighter and more fruit-forward, with tropical fruit notes. Lighter and livelier in the mouth than the first Chard, with a smooth finish. Soquel 2007 Pinot Noir, “Partners’ Reserve,” Lester Family Vineyard, Santa Cruz Mountains. Vibrant ruby color, showing slightly floral aromas along with cherry, earth, and herbs. Medium-bodied with moderate tannins. Soquel 2010 Pinot Noir, “Partners’ Reserve,” Santa Cruz Mountains. Medium color, the nose displayed black cherry, plum, and spice. Another medium-bodied effort, and slightly more tannic on the finish. Soquel 2009 Pinot Noir, “Partners’ Reserve,” Estate, Santa Cruz Mountains. Medium ruby color, this was less fruit-forward, showing more earth and herb aromas. Bigger and more structured on the palate, it finished with grippier tannins than the other two Pinots. Soquel 2008 Zinfandel, “Ancient One Hundred Eight Year Old Vines,” Schmierer Vineyard, Lodi. Medium color, boysenberry and blueberry fruit along with lots of spice and touches of pepper, vanilla, and dill. Very distinctive Lodi Zin character, with ripe fruit, rich mouthfeel, and moderate tannins. Soquel 2010 “Trinity,” California. Blend of Nebbiolo, Sangiovese, Zinfandel, and Syrah. Medium color, bright cherry, spice, earth, and lightly floral notes with a touch of sweet oak. Medium-light bodied, with lively acidity and a long, tangy finish, nice. Soquel 2010 Sangiovese, Luna Matta Vineyard, Paso Robles (barrel sample). Medium-light color, showing bright cherry, earth, mineral, and spice aromas. Lively and minerally on the palate, with lots of structure, this finished with moderately big tannins. Quite a promising young Sangiovese. Soquel 2008 Sangiovese, Luna Matta Vineyard, Paso Robles. Medium-light color, ripe cherry fruit, earth, and baking spices. Great acidity and structure, with grippy tannins, very nice wine that should age well. Soquel 2008 Nebbiolo, Luna Matta Vineyard, Paso Robles. Light garnet color, somewhat shy aromatics but showing cherry, tar, and earth notes along with a touch of oak. Medium-light on the palate but with a big structure and a tannic finish that indicate extended cellar time might be in order. 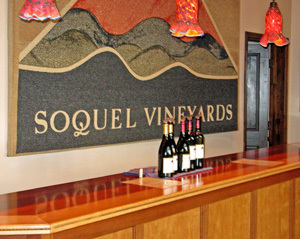 Soquel Vineyards was launched in 1987 by twin brothers Peter and Paul Bargetto and their friend Jon Morgan. If the Bargetto name sounds familiar, it’s because Peter and Paul are part of a well-known Santa Cruz Mountains winemaking family, their grandfather John Bargetto and his brother Philip having founded nearby Bargetto Winery in 1933. The Soquel Vineyards property is located on a hillside above the town – on land that John Bargetto had once owned – with a view of Monterey Bay in the distance. The winery building’s roof tiles came from a farmhouse in Lucca, Italy dating to 1751. Paul and Jon are the head winemakers. Fruit for the Soquel wines is sourced a variety of vineyard sources, mostly in the Santa Cruz Mountains but also from Lodi and Paso Robles. The estate vineyard near the winery includes recent plantings of Pinot Noir and Nebbiolo. 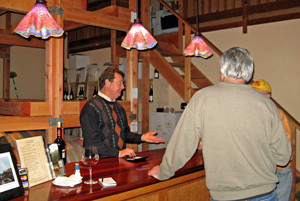 Soquel produces a variety of wines, including Chardonnay, Sauvignon Blanc, Pinot Noir, Zinfandel, Sangiovese, Nebbiolo, Merlot, Cabernet Sauvignon, and a proprietary blend called “Trinity” – the 2010 bottling that we tasted was a blend of Nebbiolo, Sangiovese, Zinfandel, and Syrah. Why “Trinity” when there are four grape varieties in it? The blend changes from year to year, and I believe that the 2010 vintage may be the first that has not featured just three varieties. Most wines are in the $16 to $40 range with a couple of others going for more – a Cab from Napa Valley is $75. Production is around 4,500 cases per year. 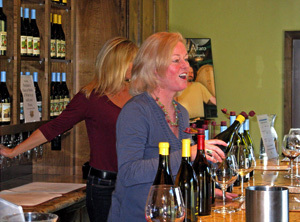 Mary was behind the long wood bar in the tasting room, and she poured us a sampling of the winery’s current releases. As it turned out, we benefited from arriving late in the afternoon, as we were also able to taste some additional wines that had been poured outside and had been brought in at the end of the day. As we tasted, Peter Bargetto came into the tasting room and invited us to come into their barrel room to try a 2010 barrel sample of Sangiovese. We mentioned to Peter that his Sangiovese and Nebbiolo come from one of the same vineyards – Luna Matta Vineyard on the Westside of Paso Robles – from which Bryan Harrington sources his Nebbiolo. After hearing that, Peter was generous enough to track down and open bottles of 2008 Sangiovese and Nebbiolo for us to taste. Several of the Soquel wines were notable – I enjoyed the 2007 Pinot that we tasted, and the 2010 “Trinity” was a distinctive blend and a fine value at $16. But I felt that the real standouts here were the Italian varieties. The Nebbiolo was good and the Sangioveses were excellent – the varietal character really came through, and the subtle oak treatment and excellent structure helped set them apart from most other examples I’ve tried from California. The 2010 Sangiovese barrel sample in particular was terrific, and I’d love to taste this again after the wine is bottled and has a few years of cellar age. The daylight was starting to fade by the time we left Soquel and began our drive back north over the mountains. This was a most pleasant trip to the southern part of the Santa Cruz Mountains AVA. We had the opportunity to talk with the winery owners at all four of our visits – a rarity in many other California wine regions but not so unusual here. The area around Corralitos is scenic, unpretentious, and features some fine and distinctive wines. And in a wine region as spread-out as the Santa Cruz Mountains, spending a day touring the Corralitos Wine Trail and nearby wineries is an easy and convenient introduction to the area and its wines. As always, thanks to everyone that we visited for being so generous with their time and their wine.